Hey... Shoe Makers... Ever Heard of a Ruler? What's the deal with extra long shoelaces? It drives me nuts when I get a new pair of shoes and the laces are way too long. Why on earth would they do that? You end up with laces that literally drag on the ground unless you tie a double knot. Don't they know how to measure? Look, I'm sure there are some people out there that like long laces, but for the most part, most of us simply want to tie our shoes the old fashioned way, with one simple not, so why not include normal sized laces? For the small number of people who actually prefer long laces, let them buy their own laces and go to town and let the rest of us have normal laces. Tire Tread Shoes. Better Traction. Longer Lasting. In 1970, Nike co-founder Bill Bowerman revolutionized the shoe industry when he designed the soles of shoes using a waffle iron. Bowerman's main insight was looking outside the shoe industry for inspiration, and he found it in the least likely place, his kitchen. Every day, scores of designers and engineers tinker with countless types of rubber, creating new patterns that will eventually become Nike's next generation of shoe soles. The key to a great running shoe is optimizing the way that the shoe flexes, absorbs impact, and grips the ground. 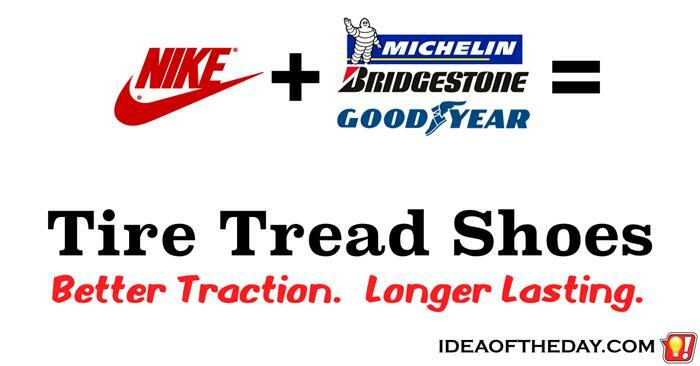 Not surprisingly, you'll find designers and engineers with the same goals someplace else... tire companies. Open Backed Shoes. Why Don't Some People Know About Them? Why do so many people have shoes with crushed backs? I can't count the number of people I see wearing shoes or slippers with the back crushed to the point that they essentially use them as an open backed shoe. Don't these people know they buy open backed shoes? What's up with that? Since open backed shoes are pretty common in stores, I often wonder what is going on in their minds. Buying a regular shoe, then crushing the back turns it into an open backed shoe with a lumpy back. How is this better than simply starting with a properly designed open backed shoe? I'm sure there's some benefit to starting with regular shoes, then crushing the back, but for the life of me, I can't figure it out. I thought I knew pretty much everything about tying my shoes. It just goes to show you, you can learn something new each day, even something as simple as a better way to tie your shoes. What's strange about it, is most people have an extra set of holes on their running shoes, but they have no idea what they're for. Neither did I, until I saw this video from Illumiseen on YiouTube. Believe it or not, as of today, this simple video has been watched over 28 MILLION times. That's simply amazing considering it's just two minutes of footage of a guy showing you how to tie your shoes.